In the heart of Valdichiana, in Tuscany, the farmhouse Il Mandorlo stands out in a relief which is by the side of the small town of Fratticciola, a few kilometres away from the renowned town of Cortona. 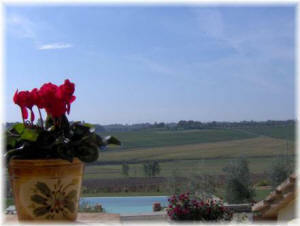 From its location, it enjoys a very beautiful view over the surrounding sweet hills, typical of the Tuscan countryside, dominated by the green of the vineyard and age-old trees, by the yellow of the sunflowers in summer and the intense shades of the earth in the various seasons of the year. The old rural house, whose heart goes back to the 17th century, has recently been restructured and kept the original shape and materials. 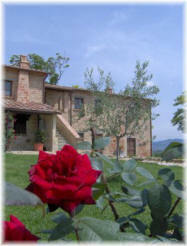 The centre is isolated and dipped into the peace and quiet of the country, but a few minutes away from the main roads. It also enjoys the sunlight from morning to night, and also the soft hilly wind. Internally, it is divided into five apartments, provided with every comfort, while on the outside, the swimming pool (14,5 x 7 m) in a panoramic position, with a striking view over the hill of Cortona, is able to offer enjoyment and moments of intense relax. There is also a football field for those guests who want to practice sports, and have relaxing and invigorating walks or bicycle rides through the close-by paths. 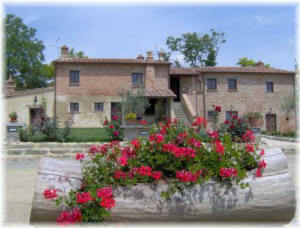 During the stay at the farmhouse Il Mandorlo, the guests can also use the outdoor oven and barbecue, and enjoy the seasonal fruits of the family orchard and participate to the farm life. It is available a car park, external and covered up.